If you are preparing your own mayo base, whisk up the egg yolk with Dijon and lemon juice, then slowly stream in the grapeseed oil, letting it lightly pour down the sides of the bowl while you whisk. Stream in the oil until an aioli forms; season with sea salt, to taste. Combine the homemade aioli or store-bought mayo with the ketchup, relish, garlic, salt, pepper and herbs. Pre-heat the oven to 375°F. Pre-heat a flat griddle or cast iron skillet over medium-high heat. Arrange the bacon on slotted pan and bake until crisp, 15-18 minutes. Combine the beef with Worcestershire sauce and season with kosher salt and pepper. Form six patties, thinner at the center for even cooking, and drizzle them with oil. Cook the patties for 8 minutes, turning occasionally. Melt the folded Swiss cheese over each burger during the last minute or two of cook time. Place the cheeseburgers on the toasted roll bottoms and top with bacon, lettuce, tomato and onion. Slather the tops with the dressing and set in place. In Recipes-list.com we have selected the most viewed recipes from category - uncategorized . Enjoy the best recipes specially selected for you! 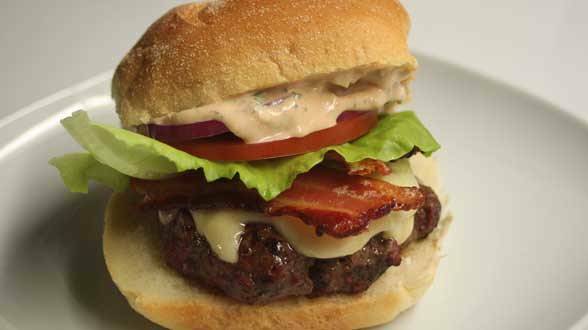 BLT Burgers with Swiss and Russian-Style Aioli with Garlic and Herbs is the right choice that will satisfy all your claims.